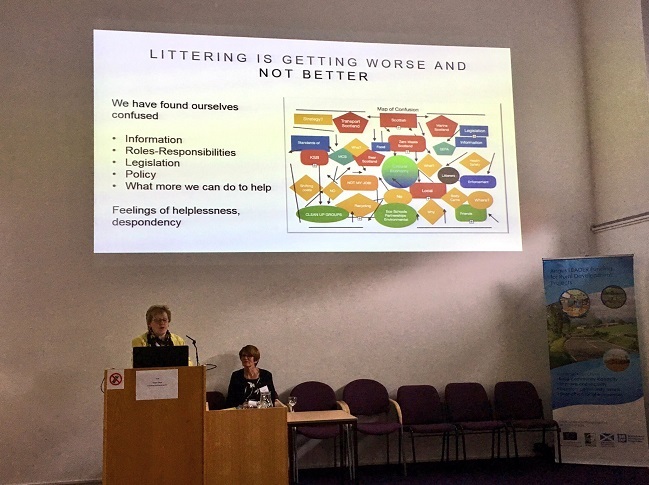 Emilie Lindbladh from Angus LEADER/European Maritime and Fisheries Fund tells us about the Arbroath Litter Summit which took place on 13 November 2017 in Arbroath. The community group East Haven Together launched Scotland’s first community-led litter summit on 13 November, fully funded by LEADER. They provided a powerful voice for members of the public involved in clean up initiatives throughout the county. The event brought together representatives from across the Angus community. One of the key objectives of the day was to make people realise that local authorities are not singularly responsible for preventing littering or for cleaning up. Organisations that attended and spoke at the summit were, Zero Waste Scotland, Keep Scotland Beautiful, Marine Conservation Society, Leithers don’t Litter and of course East Haven Together. Other speakers were Graeme Dey, MSP and Susanne Austin from Angus Council. They all provided very interesting and eye-opening information regarding rules and regulation, the impact littering has on the society and environment and abundant stories of inspirational community actions. The summit concluded with a panel and the opportunity for the audience to ask questions. Outcomes of the event were the launch of East Haven Together’s Adopt-A-Street scheme and their Community Litter Prevention Action Plan as well as a greater awareness that littering is a shared responsibility. Visit the East Haven Together website for more information. Visit the Angus LEADER website for more information about support available. You can find out about LEADER across Scotland in the LEADER section of our website, where you can also submit an Expression of Interest form if you have an idea for a project. And watch our short film below to find out more about six inspiring projects that received funding in the LEADER 2007-2013 programme. Scottish LEADER programme from ScottishRuralNetwork on Vimeo. Angus and Fife LEADER had the pleasure of hosting a study party from Estonia, to share ideas and inspiration for local rural development projects. Angus delegates, interested in driving forward rural skills in Angus, participated in a learning visit to Fife Rural Skills partnership recently. Angus Local Action Group will play host to 11 visitors from Georgia in early February.